[ED:] Last month, Tesla Motors [NASDAQ:TSLA] CEO Elon Musk announced a brand-new software update (version 6.2) for the Tesla Model S which included some new features designed to “end range anxiety” for good. You can read about the announcement and the improvements that the software offers over previous versions in our live blog, but regular contributor Dennis Pascual isn’t sure he really gets range anxiety any more. Not since he upgraded from a BMW ActiveE to a Tesla Model S and started using the hypermiling techniques he learned from owning a smaller-range electric car, that is. When Elon Musk tweeted that an over-the-air software update would end ‘range anxiety’ for good, I didn’t think so much about thedisappointing announcements regarding the 6.2 software patches, but about when the last time was that I’ve actually experienced range anxiety. With long range and supercharging stations, range anxiety isn’t a thing. I must admit that it’s been a while for me. We decided to move to Tesla Motors electric vehicles because we didn’t want to have to worry about range. Both our Tesla Model S and Tesla Roadster have a range of at least 170 miles. As for recharging, the Model S can charge at over 300 miles per hour at a Tesla Supercharger, or recharge at a CHAdeMO DC quick charging station with the Tesla-to-CHAdeMO adaptor at over 130 miles per hour. With AC charging, our Model S can go up to 80A (or approximately 58-62 miles per hour) when plugged into an appropriate charging station and the Roadster can go up to 70A (or approximately 56 miles per hour). That’s plenty fast recharging. Besides, if you charge overnight as most people do, it’s time you’re spending asleep anyway. When we first started our adventure with electric vehicles with the Active E, range anxiety was a byproduct of moving from a nearly limitless range to one where each full charge lasted 80-100 miles. However, it wasn’t long that I was making the statement that the range of the Active E was limitless, as long as you can get charge and have the time to wait for a charge. If a charger was available, I plugged in, even at 110V when no level 2 charger was available. The principle of “ABC”, Always Be Charging applied to my life with the Active E.
It was not unusual for me to do 140 mile days in the Active E. It required charging at multiple places, but level 2 at 6.6 kilowatts and later at 5.2 kW is not exactly speedy, but it isn’t slow either, at least at the time. Now that I’m used to Supercharging, quick charging and even 40 Amp/10kW charging over a NEMA 14-50 or 6-50 connector, it seems that approximately 20 miles per hour seems so slow. In 2012, public charging was fairly plentiful and easy to use in Southern California. Rarely did I have to wait, and most of the places that I found to charge at level 2 were relatively free. Things became relatively harder at 2013. One could say that projecting the pending difficulty in obtaining public charging with shorter range electric vehicles definitely helped contribute to the decision to buy longer-range Tesla Motors vehicles. So, Range Anxiety with the Model S? Not really. One of the first things that I did when we first got our Model S and Roadsters were to get some of the available charging adapters. Aside from J1772, we got adapters for NEMA 6-50 as well as NEMA 14-50. so that we could charge the car at up to 40A. Though the Model S (with dual chargers) and Roadster can go to 80A and 70A J1772 if presented with that speed. Plus, as I recently wrote, I just got CHAdeMO for our Model S, that’s a really respectable 130 miles per hour. Range Anxiety with CHAdeMO and Supercharging? Nah. Which brings me to hypermiling and Elon’s recent announcement. Hypermiling is a skill that I learned about and learned to do when I first got the Active E. Getting the most miles per kWh was the goal (or consuming the least wH per mile as is the measure on the Model S, which I’ve measured at 307 wH per mile recently). In a nutshell, hypermiling involves driving at a constant speed, or motor use and using larger vehicles, trucks, etc. ahead of you to lower the wind resistance that impacts your vehicle. With the Active E and the size of the 1-series that it was adapted from, it was relatively easy to find vehicles that are larger than it to drift behind and it was noticeable to see the miles per kWh climb. I’ve even hit a respectable 5.0 kWh (200 Wh per mile) on the Active E, as heavy as it was. 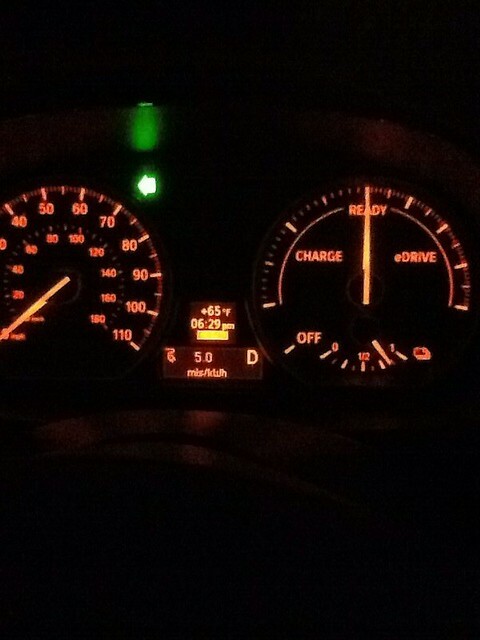 Hypermiling in the BMW could yield 5 miles per kilowatt-hour. My most recent trip to San Diego from Los Angeles County gave me a long time to ponder this thought and put a few things to test with the Model S. Since moving to the Model S, I really haven’t given hypermiling any further thought. Until now. As more Model S roll off the factory floor in 2015 with Adaptive Cruise Control or Autopilot, I’ve been intrigued with the ability to set the number of car lengths to the vehicle ahead of you. Figuring that such a feature really lends itself to hypermiling. With more recent cars, adaptive cruise control is useful for hypermiling. However, a more fundamental question presented itself to me. Can I even hypermile a Model S? So, during this same trip to San Diego, I followed a smaller delivery truck that was the ideal candidate for my test. I started the drive making note of my average 30 mile consumption that is constantly graphed on my dash, as you can see below. 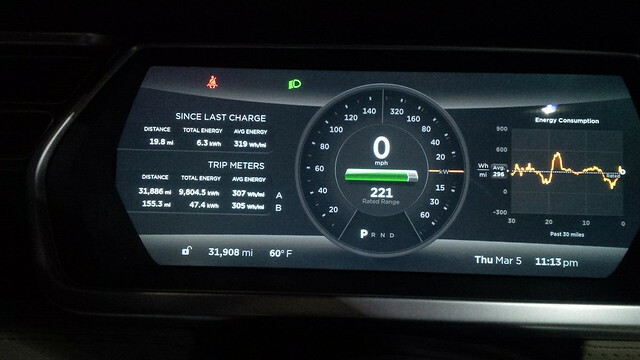 I’ve set my Model S dash up to show the last thirty miles of energy use. I decided to see what the effect was if I implemented hypermiling techniques behind smaller vehicles. As predicted, it didn’t really help much. Too much of the wind resistance was not cut-down by the smaller vehicles. Oh and Range Anxiety? Not really: I did that San Diego trip and back (220 miles return trip) with no anxiety. This post originally appeared on Dennis’ blog.